On the contrasting lives of Chinese dissidents in prison. Human rights activist and lawyer Teng Biao. Photo: Courtesy of Tienchi Marin-Liao. Liu Xiaobo, 2010’s Nobel Peace Prize winner, is the only imprisoned laureate in Nobel Prize history. If no amnesty for Liu is prematurely granted, he will serve his sentence until 2020. Despite his odyssey as a dissident over the last two decades, in his famous final statement to the court, Liu said “…to underscore something that was in my June 2nd Hunger-strike Declaration twenty years ago: I have no enemies, and no hatred…I have been held at two different locations and have dealt with four pretrial police interrogators, three prosecutors, and two judges, and all of them have been reasonable and moderate in manner. They have often shown goodwill.” Liu also said that he has observed progress in prison management. These words created much animosity among international intellectual circles. A handful of people have even attacked Liu for his capitulation to the communist regime, palliation of the cruel prison system, and betrayal of the democratic movement. One of them, the Stockholm-based writer and critic Chen Maiping, even submitted a letter of complaint to the Nobel committee, requesting they withdraw Liu’s prize. Treatment of dissidents differs from place to place. I recently met lawyer Teng Biao and writer Ran Yunfei, who were both arrested in 2011 during the Arab Spring. Teng was detained for 71 days, Ran for 170 days. After their release, both kept silent, not wanting to reveal the particulars of their experiences in prison. People believe that they made promises to the authority not to expose the internal situation of the detention center, but there was no deal with the police; silence is more or less a personal decision. 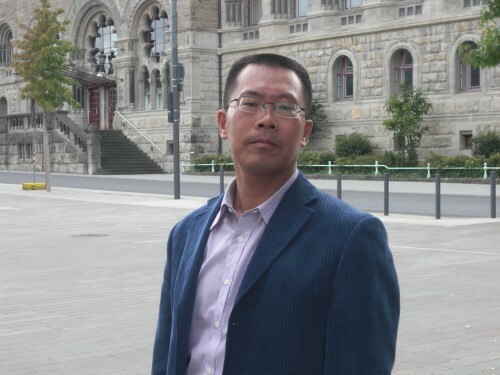 At 40 years old, Teng Biao has been a human rights activist since he received his Ph. D. a decade ago. With some colleagues he composed an open letter to the Standing Committee of the People’s Congress, requiring the authority to abolish the irrational “Detention and Repatriation System,” which affects the basic rights of China’s migrant population. Suggestions for the “Improvement of Protecting Human Rights in the Constitution” was another important document, which he drafted with several legal scholars. Teng also became active in the movement to rescue the lawyer Zhu Jiuhu, who had tried to help the private oil industry in Shaanxi. However, Teng’s most well-known case was a common investigation, with the blind lawyer Chen Guangcheng, into the barbaric implementation of the one child policy in Linyi. In addition, in 2010 Teng Biao founded Xingshan Research Center in Beijing to research the death penalty and other legal issues. On February 19, 2011, Teng was kidnapped by the security police. During his disappearance, no one knew his whereabouts and his family cut off contact with the outside world. Even after his release, he did not break his silence. Many months later he reappeared at the public, jointed national conference. Since October 2012, he has been a visiting scholar at Chinese University in Hong Kong. Teng is a quiet man, eloquent and logical. He talks about the insults and torture he endured only in private circles, his emotions tightly controlled. “When you enter the prison gate, the first thing you get is slaps on the face, hundreds of times, till you have a swollen water head,” he has said. During the two-and-a-half month detention, there were three phases. In the first two weeks, he was deprived of sleep and forbidden to bathe or take a shower. Two to three men were beside him day and night in a small room. He tried to exercise, sing loudly, and recite poems but they forbade all of it. Then followed a terrible three week period, where he had to sit straight on the ground and face the wall from early morning till midnight. If he collapsed, so fell the fists and kicks on him. The last 36 days, he had to carry the shackles and irons the whole day through. “It challenges your physical limits, it is astonishing how much one can endure,” Teng concluded with a bitter smile. The writer Ran Yunfei attracts lots of online followers through his blogs and Twitter. Although his blogs are shut down frequently, the prolific writer is like an acrobatic tumbler: If one blog is pushed down, a new one is already up and on the way. Ran is good at historical reflections. He is a knowledgeable man with social, political, and cultural commentaries that are sarcastic and incisive. As a Charter 08 co-signer, he was under residential surveillance. Like Teng Biao, he was also disappeared during the Jasmine Revolution in February 2011. The worry was that he was accused of “inciting subversion of state power.” Many believed that he would be sentenced heavily. Fortunately, Ran was released after half a year. People never really knew what happened to him during that dark period. Today, Ran is allowed to participate in international conferences and travels to Japan and the West. “Did they torture you?” I asked him. He shook his head, “Nothing of the like. Instead, I could read in my cell; I read several hundred books.” In the beginning, he was afraid that he would be lost forever. With the kind of accusation Ran received, ten years imprisonment is the minimum sentence. Yet, US Secretary of State Hillary Clinton handed three names to the Chinese government, including Ran’s, and with this move he regained his freedom. “I cannot and will not tell people that they treated me fairly in prison; it makes me sound like I’ve kotowed to the regime.” Ran is right. It’s a crime to lock an innocent person behind bars, and not torturing him is not a virtue. Dictatorship is a decapitator, no matter if it tortures you or treats you well. 2 Comments on "Dictatorship is a Decapitator, Whether it Tortures You or Treats You Well"
I read this article first time today (2013-12-29). It is very interesting, because I have never “submitted a letter of complaint to the Nobel committee, requesting they withdraw Liu’s prize” as the author Liao wrote. This is again an example to show how the words that many Chinese writers wrote, including the author’s, are not relible. I have only written a letter to the chairman of Nobel Foundation in Stockholm to inform him that there are false information in Liu Xiaobo’s Nobel lecture text that was read in Oslo. For example, Liu wrote in the text that by the two trials he got in China, he could speak to Chinese public. This sentence was then also quoted in one of the biggest Sweidsh newspaper SVD (Swedish Daily, 2012-12-10). Swedish readers would believe that Liu could speak to the Chinese public by trial. But it is a simple fact that political trials of dissidents as Liu Xiaobo in China are never open to the public, not even open to the family members or media people, or diplomats. Liu was not even allowed to read this text completely. It was also interesting how the text come out from the court. So, I “suggest” only to the chairman that Nobel websites withdraw this false text with false information so that no more wrong citations should be spread, or make a footnote there. I warn readers here that never trust a Chinese writer’s words. Maybe, even my words, because I am also a Chinese writer, and I hade worked with Liu Xiaobo in the Independent Chinese PEN Centre for years (when he was the president I was the vice president and General Secretary). I know him too well. I have been defending for freedom of expression for decades (since 1979 democratic wall in China), and I am still a member of International PEN (as a member of Sweidish PEN, even board member for two terms). But I swear that I will never defend the freedom of wrong and false expression. …And since freedom implies voluntary restraint, members pledge themselves to oppose such evils of a free press as mendacious publication, deliberate falsehood and distortion of facts for political and personal ends. So, my letter to the Nobel Foundation’s chairman is based on my belief to this charter. No one has the right to spread false information, no matter whether he is a Nobel prize winner or not. Also, in the more than one hundred year’s history of Nobel prize, the Nobel foundation has never withdrawn any Nobel prize any year despite the existence of several petitions pushing for retraction of controversial Nobel Prizes, for example for retraction of Peace prizes to Arafat or Kissinger or Obama. It is unlikely that the foundation will change its rules to make a revocation. Therefore, no one has ever been stripped of a Nobel Prize, because this is actually specifically forbidden by the organization which administers the Nobel Prizes. According to the Nobel Foundation, “no appeals may be made against the decision of a prize-awarding body with regard to the award of a prize,” and no prizes can be revoked after the fact, no matter how controversial they may seem. With this knowledge as background, I will never submitted a letter of complaint to the Nobel committee, requesting they withdraw Liu’s prize.